The Advance SC6000 rider scrubber provides more productivity with an economical way to clean. It has a 30% greater run time due to it’s large battery capacity. Edge cleaning is made easy with its off-set deck. SmartFlow™ will adjust water flow in accordance with the machine’s speed; this can reduce the use of water and chemicals by up to 50%. SmartKey™ includes a supervisor access key and a user-level access key. Squeegee blade replacement requires no tools and disc brushes are click-on making replacing these parts fast and easy. Its designed with steel doors to protect the deck, decreasing the chance of damage to important machine components. The optional EcoFlex™ System is cost-efficient, offering just the right amount of power and solution to each application. The SC6000 provides industrial grade productivity while still being easy to use and cost-effective. Eco-friendly and effective cleaning is made possible with the optional, innovative EcoFlex™ System. It controls the amount of detergent being used without compromising results, providing actual savings. Made to be user-friendly, the operator can easily change the amount of detergent being used, from heavy to light. If the operator has a more soiled area to clean, they can activate the “burst of power” feature with the touch of a button. It increases solution output and detergent for intense cleaning power and simply returns to previous settings. SmartKey™ is a key control system that allows you to customize each operator's usage parameters. The admin key gives you access to settings, limits, impact events, logs, etc. Each operator key is serialized so that data can be stored based on operator usage and log certain events. 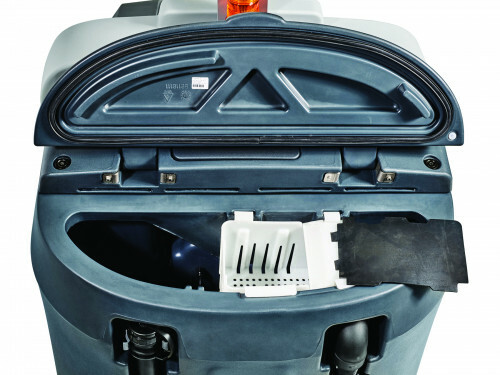 The SC6000 has a large recovery tank lid that gives you the ability to see the entire tank when cleaning it out. The lid utilizes press in gaskets that makes gasket replacement a breeze and ensures a great seal. The debris catch bin inside the tank reduces the chance of a clogged drain hose by collecting the debris before it can settle to the bottom of the recovery tank. The control system on the SC6000 is very intuitive as each button has an icon that clearly indicates its function. 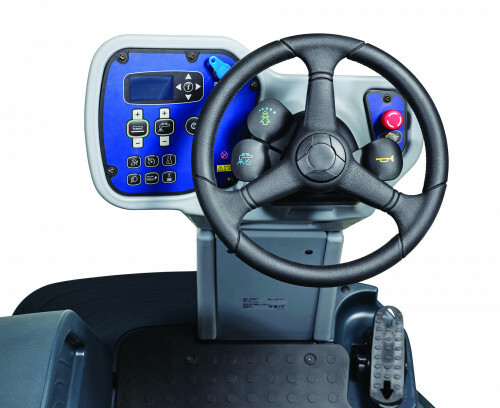 One-Touch™ operation is utilized on this scrubber and the steering system is very ergonomic for the operator. Forward and reverse functionality is incorporated into the pedal with automatic braking.